Now is probably not the time to launch a startup in the City of London and surely now is NOT the time to start giving away digital screens for free but the Financial Times last week reported that a company called Media Metrica has agreed an interesting 15-year contract with the City of London Corporation to deploy 100 pairs of video screens free of charge in return for the right to operate the on-street information channel, which will be called Renew. 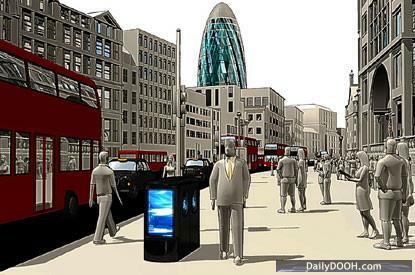 Renew is going to be an “outdoor financial channel” in London’s Square Mile based around bomb-proof litter bins! Okay not exactly litter bins, the ‘Street Furniture’ in this rollout is actually screens housed on the side of bomb-proof recycling units for newspapers, cans and bottles. We haven’t seen any pictures yet but it sounds interesting and is a nice twist on useful ‘Street Furniture’ in City centres. The FT reported that the company has been working on the idea for six years BUT that it still needs to secure a sponsor to put the units, which cost about £30,000 each, on to the streets by autumn next year. Kaveh Memari, the chief executive and co-founder, said the units’ blast technology had been thoroughly tested to prove they would be safe – the City removed its litter bins at the height of IRA attacks because they were target points for terrorist bombs. Media Metrica has been through four rounds of financing and allegedly already raised ‘a couple of million pounds’. The business has 30 shareholders. There’s actually a lack of outdoor advertising in the Square Mile so for the right brand it could be an interesting opportunity and we like the clever play on words with the name ‘Renew’ i.e recycling! September 7, 2004, Clearwater, FL. BlastGard International, Inc. (OTCBB: “BLGA” – news) is pleased to announce that it has entered into an exclusive license agreement with Media Metrica Ltd. for the use of BlastGard’s BlastWrap™ product inside Media Metrica’s RE:NEW modular recycling units. This entry was posted on Saturday, October 11th, 2008 at 12:02 @543 and is filed under DailyDOOH Update. You can follow any responses to this entry through the RSS 2.0 feed. You can leave a response, or trackback from your own site. Can already read the headlines, “Digital Signage Gone Rubbish” cool concept, however see some major management issues, vandalism & graffiti. Why not acquire the remaining revenue from the city of London, EMSO-emergency management system override and mount the screens on a pole out of reach, delivering the same or better results.